One of my personal challenges, my “stumbling stones,” is my propensity to abdicate the middle ground for all or nothing thinking. For example, I tend to infuse big rich concepts like the above with all the meaning I can put into them, then seek to live into them. Which makes it extraordinarily difficult to find satisfaction, pleasure and gratitude in my everyday living; let alone serene contentment. Even though I know I have this tendency—this unhelpful habit—I often forget. Then trip over it, and slide into fuzzy, scattered, thinking. Although I enthusiastically encourage, promote, and practice Conscious Aging as a Spiritual Practice (CASP), I still find myself reverting un-consciously into behaviours and fears conditioned by my adverse childhood experiences (ACEs). When I become conscious of doing so I can, and generally do, consciously try to step back into my CASP training. Whereupon I tell myself to remember that my aim is for “progress, not perfection,” as 12-Steppers say. Each of us has our better self. To remember and honour that at all times is a really good idea. But when we forget that, as often happens, it is counter-productive and self-defeating if (and when) we berate our self for being our less-than-ideal self. This is akin to self-abandonment by the best friend we have. Yet I do it more often than I care to admit. And I know others who do it too. Don Miguel Ruiz recommends Four Agreements (1997) we can each make with our self that will improve our self-nurture, self-care, and everyday experience of wellbeing. These are four very good, easy to understand, and easy to apply pieces of advice that yield results each time we remember to practice them. First, he encourages us to “Be Impeccable with Your Word.” Which means not to be sloppy with our thinking, because our “word” is our vision and motivation to do what is important to us. Secondly, he advises we “Don’t Take Anything Personally.” Because anything anyone says about, or expects of us, or thinks we should be doing, reflects their needs, expectations, and “dreams” about how the perfect world should be and operate. They are really not about us at all. Thirdly, he counsels us to “Don’t Make Assumptions.” Because when we do, we tend to confuse our assumption(s) with the (full) truth of any matter. For example, as when I assume because I know something, I should, or can, always do it—well, if not perfectly. Fourthly, that we should “Always do Your Best” in any given situation. Most importantly, he teaches that our best today does not always need to be better than yesterdays, or our all time best. If we try too hard to do more than our best in current circumstances, he says we will exhaust our self, and “in the end, your best will not be enough,” he wisely counsels. The nonobvious point here is that we don’t need to be constantly doing something to “nurture” our self every moment of every day in order to nurture our overall journey. Similarly, we don’t need to be “clappy happy” 24/7 in order to be generally happy. Indeed, one way we can pro-actively nurture our self is to reduce our stress levels by not doing something…perfectly. “Don’t just do something, stand there,” is a wise reversal of the injunction to “do something…anything!” By regularly stepping back from constant thinking about our 2DO list we will often be honouring that 4th agreement with our self. Moreover, we may well find that we don’t need to be doing the thing at all, let alone perfectly. This is especially good advice for us who have learned to associate our worth with a long full schedule. Every time we remember to pause to nurture our self, in both our doing and our not doing, we strengthen the habit. And our day is better for doing so. And the more we will be satisfied with it. Even when our “best” today may not fulfill our wildest hopes and expectations, we can be contented with our experience of our unfolding days. Moreover, as Ruiz reminds us, as we strengthen our habit of always doing our best on any particular occasion then our best gets better with practice and over time. So, I intend to “nurture” my self this year by doing my imperfect best each day—or at least each week. That is, to seek to consciously remember to DO at least one thing that nurtures my spirit and soul—which might be nothing! Also, to consciously not add everything I can think of to my 2DO list, then try to do it all…perfectly. And most importantly, to consciously reduce, and maybe jettison, my knee-jerk association of perfection with doing my best. All of which simply means to feed and protect the essential parts of my truest self; And, to do what I can at any given time to support and encourage my quest for contentment in my unfolding life. Nonobvious perhaps, this also means to honour my self and celebrate my journey to psycho-spiritual wholeness as it is; which in the end will be imperfectly perfect, because it will be the best I’m able to manage in my age-changing circumstances. Hopefully, I’ll feel fulfilled when I arrive at my terminus. 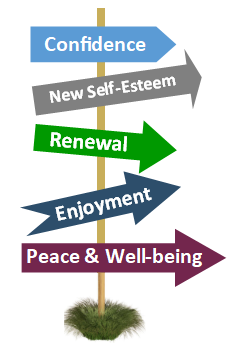 If any of this resonates with you, and you want to learn more about how to nurture yourself pro-actively, or reactively by removing obstacles to your wellbeing, please contact us for a free consultation through paul@newfutures.ca, or 519-820-2508. It will be confidential, and there is no obligation. I’d love to talk to you and share our journey. Blessings on your journey into a contented nurturing 2019.